18 Amitabh Bachchan moves that prove he’s the Baap of Bollywood! Think Amitabh and you automatically think of grandeur, of class, sophistication and modesty. Big B has ruled Bollywood and our hearts with his brilliant acting, dialogue delivery and amazing expressions. It’s not for nothing that he is known as one of the most amazing actors of our times. But then, it is hardly ever that Big B is applauded for his dance moves or for his amazing actions. You have Hrithik who is loved as Bollywood’s dance boy but Big B despite being 73 has an energy that very few possess. Right since his novice days, he has been charming everyone with not just his acting but even his amazing dance. Or if not dance, just some of his smooth, slick moves still send us into a tizzy! Wondering what we’re talking of? Check him out here! Because only he can light up the stage like that! This is Big B’s latest foray on the small screen of television. But then, with him in the show, but naturally the show will reach a different level. The promos of the show are out and here’s how Big B totally rocks his moves in the upcoming show! Look at the man! Just look at him! He’s got the swag! He is perhaps the only one who could pull off acting like his son’s son in Paa! 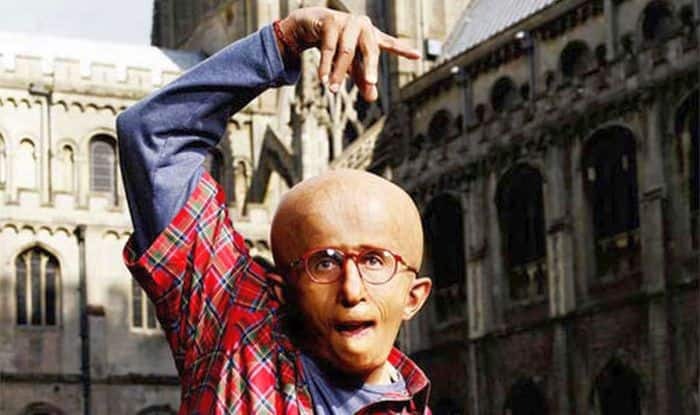 Acting as a child suffering from Progeria, he stunned us with the energy of a 13 year old at the age of 70! Auro in Paa showed his child moves that even adults love! When Bhaskor proved that even music can move a surly man’s heart… errr… stomach. This Bengali song from Piku where Big B shows his dance moves is one enchanting scene! When he showed us he can rap like no one else! Birju proved that Amitabh is the one who adds ‘special’ to the special appearances! Like, he’s a dude! Totally! Who can shake a leg with Ganesh Acharya without batting an eyelid? Big B of course! He’s so good that he can shake a leg even as a ghost! And make an entire colony dance along with him instead of running away terrified! This was a movie where the two stalwarts of B-town came together. And did they break the floor! SRK with Big B… The mind-blowing combo! While there are tons of moves he’s amazed us with in recent times, there’s one that we absolutely and totally just cannot forget! The one called Kajra Re! But hey! It’s not only now. Big B has been flooring us with his dance moves since ages! Just let the tune come on and everybody jumps right in! Come March and this song begins to blast off every street corner in preparation of India’s favourite festival! Quite the adventurer our Big B was! Just look at that expression in his eyes here! Oh, and that lucky saree! And this one… This just has to be the most original step Bollywood ever created! Think of dance numbers and you just can’t leave this one out! Cheesy, classy and so much fun! Oh Big B, you. Just you light up our lives!